Lots and lots and lots of dragons. Scaly, spiny and snaggletoothed, soaring through the sky on leathery wings. In the manner of a flock of seagulls or a murder of crows, en masse the mythic beasties comprise an inferno of dragons in “How to Train Your Dragon: The Hidden World.” It’s the third and reportedly final chapter in the “How to Train Your Dragon” animated movie series that first took flight in 2010. If in fact it is truly the wrap-up of the franchise (sequel-hungry Hollywood is notoriously reluctant to permanently put a cash cow like this out to pasture), it’s going out on top. The vastness and beauty of its colorful computer-generated visuals are extraordinary. We’re talking “Avatar”-level magnificence here, particularly in a scene in which main characters Hiccup (voiced by Jay Baruchel) and Astrid (America Ferrera) dragon-ride through the hidden world of the title. It’s a dreamscape of towering luminescent spires glowing green and blue and purple with golden firefly-like smallish dragons coursing sinuously through the air. The wide-eyed wonder reflected in the eyes of Hiccup and Astrid will be matched in the eyes of the audience. This really is amazing stuff. 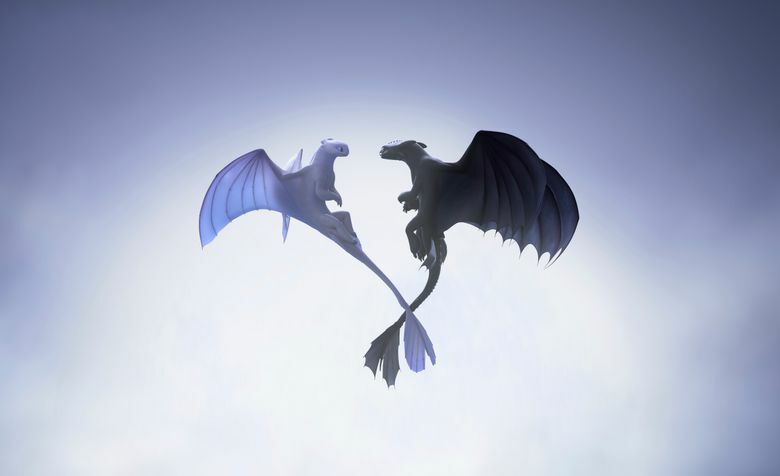 The story this time is a tale of two couples: Viking sweethearts Hiccup and Astrid, and dragons Toothless, Hiccup’s treasured companion, and the sparkly white female they call Light Fury (to contrast with Toothless’ species name, Night Fury). Hiccup and Astrid spend a significant chunk of the movie trying to figure out if they want to get married, while Toothless … well, one look at the blue-eyed Light Fury and he’s a goner. Writer-director Dean DeBlois, who also wrote and directed the original “Dragon” and its 2014 sequel “How to Train Your Dragon 2” (adapting material from the children’s novel series by Cressida Cowell), devotes several long sequences to the courting rituals of the two central beasties. The dragons don’t speak, instead vocalizing with purrs and barks, but their physical movements, especially those of Toothless — dancing, prancing, lifting ears, deploying wings, gazing rapturously with deep green eyes at his beloved — are astonishingly expressive. It’s a dragons’ world this time around as they’re equal in importance to the humans. In addition to the romances, another parallel element in the story has to do with Hiccup and Toothless each maturing into leadership roles. No longer a callow kid, Hiccup has become the chief of his Viking village following the death of this father in “Dragon 2.” But he has yet to prove himself up to the challenge of being the head man, and even his closest friends mock and question his authority. Toothless is an alpha male whose assertion of his supremacy over dragonkind is thwarted and threatened by a sneering dragon hunter, Grimmel (F. Murray Abraham), who has devoted his life to exterminating Night Furies. The stakes are sky high as Toothless is the last of his kind. That love faces the ultimate test when Hiccup must come to terms with the fact his beloved Toothless and dragonkind must separate themselves from humankind for their own good. And above it all, literally, are the dragons. Masses of them, cavorting, careening. Look up. It’s quite a sight to see. ★★★½ “How to Train Your Dragon: The Hidden World,” with the voices of Jay Baruchel, America Ferrera, Cate Blanchett, Gerard Butler, Craig Ferguson, Jonah Hill, Kristen Wiig, F. Murray Abraham. Written and directed by Dean DeBlois. 104 minutes. Rated PG for adventure action and some mild rude humor. Opens Feb. 22 at multiple theaters.